While we undertake various activities under TQM umbrella in the Iron Ore mining and processing areas, we have imbibed Total Productive Maintenance (TPM) approach in our Value Addition Business area with the specific focus to improve our maintenance management to global standard with the help of people and processes. TPM is designed to maximize equipment effectiveness (improving overall efficiency) by establishing a comprehensive productive maintenance system covering the entire life of the equipment, spanning all equipment related fields ( planning, use, maintenance etc.) and , with the participation of all employees from top management down to shop floor workers to promote productive maintenance through “motivation management” or voluntary small group activities. Therefore TPM can be thought of as an integral part of the just- in- time(JIT) philosophy, and is strongly related to Total quality management(TQM). TPM uses many of the same process improvement techniques as JIT and TQM. While TQM is to improve overall management quality, TPM is directed towards equipment improvement. For this it is said that TQM is more software oriented and TPM is more hardware oriented. Some researchers argue that the implementation level of TPM is closely related to the implementation level of JIT and TQM. Companies that are higher levels of JIT and TQM implementation, also have higher levels of TPM implementation. Actually TPM is all about a cultural change in the way people care for equipment, that is, equipment effectiveness, quality maintenance, people and Culture. In the traditional approach, maintenance is the responsibility of a specialist function within the organization, whereas in the, TPM philosophy maintenance is the responsibility of the whole company, from senior manager to machine operators. We have taken Battery II in the MetCoke Plant as a model area to initiate our learning on TPM and we have planned to replicate the learning across Value Addition Business units after TPM Kick-off. 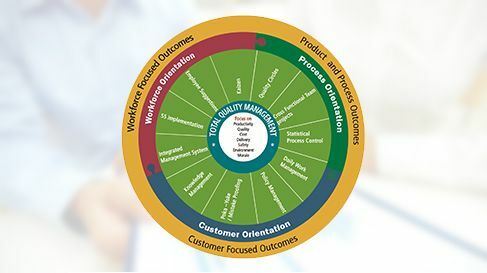 Total Quality Management (TQM) is a management philosophy and operating approach that aims to consistently exceed the current and future expectations of all stakeholders (i.e., customers, employees, shareholders and the community). TQM is based on continuous improvement in all processes, goods and services, as a result of the creative involvement of all stakeholders.